South Africa's recent past, like Ireland's, sets it up as an ideal setting for intense conflict and heightened suspense. 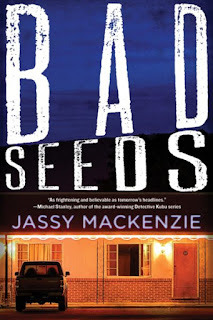 Jassy Mackenzie grabs it all and packs an impressively twisted plot with massive danger in her BAD SEEDS, her fifth thriller set in her homeland. I'm hooked on her Jade de Jong series, I confess. Jade is a private investigator with connections to the underworld of crime that she tries to ignore -- but when risks keep mounting, it's tempting to call on those old friends for help, right? 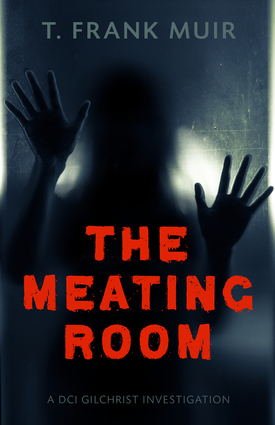 As Jade steps into what ought to be an ordinary investigation of a killing at a cheap motel, she finds herself drawn to a man she's supposed to be following and reporting on -- she's been hired by Ryan Gillespie, who works at a nuclear research station where there's been a sabotage attempt, with more to follow. In classic South African layering, Jade soon realizes there are at least two views of the research station: those of the powerful men who manipulate it, and those of the workers, some of whom are poisoned by their labors. Sbusiso and his cousin Shadrack are among the victims of the business, and Shadrack is dying -- but clinging to life through the virtue of a traditional remedy, a plant whose seeds he values highly. One mistake on David's part was all it had taken. He'd been planning to leave his wife, Naisha, but hadn't stopped sleeping with her. Now she was pregnant, and Jade was one of the few people who knew that the baby probably wasn't David's. ... Worst of all, despite the promises she'd made herself, she couldn't tell him. Because -- and this hurt her the most -- he would be happier if he never knew. Jade's interior struggles can't distract her from pursuing the tangled case in front of her, though. Who really benefits from sabotage when nuclear materials are involved? Who faces the worst risks? I enjoyed every page of this tangled and twisting plot. No need to read the earlier books, although you may want to catch up -- this one stands well on its own. (This is Mackenzie's fifth, via Soho Crime; I especially liked The Fallen.) Good to explore South African life through Mackenzie's stories and insight, one of the big pluses of international crime fiction. If they kept kicking me, if they beat me to a pulp, I might vanish into nothing, I might be absorbed by the earth, deep underground. It was terrifying. I felt robbed of my strength, and my heart raced painfully, although the twitching that ran up and down my spine was not unpleasant. Little by little, this fearful trembling was transforming into something else entirely, like a feeling of anticipation. Despite my terror, there was the definite sensation that I was patiently standing by. I experienced a moment of skepticism, but then it no longer mattered. These precise details of sensation and taste-tested emotion make up an intricate portrait in motion, perhaps a dance -- each movement wrapped in hesitation and conflicted emotion and thought. Our narrator, we soon realize, is an orphan -- or at least grew up in an orphanage, but also had devastating experiences in foster care. As if we were inside the core of a sociopath, a character on "Criminal Minds," an unfathomable criminal from yesterday's newspaper, we share the shiver of both disgust and realization. So it is that this very short novel -- 147 pages as translated by Allison Markin Powell and published by Soho Crime -- blossoms in parallel to one of Nakamura's earlier meditations on crime, The Gun. Nakamura presents the small sharp fragments of injury that lead to a mind or soul ready to perform extreme acts. What THE BOY IN THE EARTH offers that differentiates it, though, is the delicate and repeated experience of holding back from action -- what the 12-stepper recognizes perhaps as "looking through the glass" to experience a moment of the future before taking a step in the present. I found myself caught up in the dance of language and the intimate actions of the book. 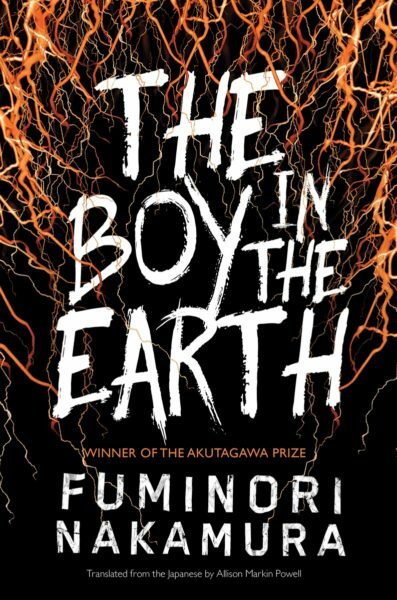 Dark, yes, and twisted, and deeply sad -- but it's also a book I'd recommend to adventurous readers who appreciate art and insight. There's nothing ordinary about it at all. And that, in the long run, becomes a remarkable experience in crime fiction. I've enjoyed the very dark and well crafted St Andrews, Scotland, mysteries of T. Frank Muir; two of them came my way via Soho Crime (Hand for a Hand; Tooth for a Tooth). I've no idea why the latest to cross the Atlantic, THE MEATING ROOM, came out from Academy Chicago (Chicago Review Press) this month, but I grabbed the book and dove right in, checking out the investigation led by DCI Andy Gilchrist. And it's a doozy. A wealthy property developer, Thomas Magner, loses his business partner to apparent suicide, at the same time that the partner's family is murdered. The connection looks obvious -- the suicide is remorse driven, right? But Gilchrist's partner DS Jessie Janes raises some initial doubts, and soon Gilchrist has his own. Still, it's hard to investigate Magner because any added attention to him looks like bias: He's already been charged with multiple sexual assaults. When the women who'd accused Magner begin either recanting or dying, Gilchrist and Janes race the clock to find both evidence and witnesses they can count on. Back in the Office, Gilchrist's mobile rang -- a number he did not recognize. "DI Smith here, sir. Sorry to trouble you again, but I thought you should know that they're dropping like flies." Gilchrist understood immediately. "Who is it this time?" "Abbott, Warren, and Williamson. All by phone again." "More or less the same. Jenna Abbott said she didn't want to go to court or even give her testimony. ... Change of heart." Alert readers will know, early on, that the unfolding crimes are likely to increase in graphic gruesomeness. (The title also suggests this.) So, reader beware ... it's going to be tough. But Muir's deft exploration of how his investigators will react to the increasing pressure on them (including in Andy Gilchrist's private life) ramps the suspense up swiftly, and I didn't want to put the book down until the finale. Scottish aspects? Not many -- mostly a good modern British-style crime novel, well paced and well written. Read one Muir, and you may well want to read some others -- but you don't need to cover these in sequence. Good stuff. Bruce Kader's first novel, MIGUEL'S GIFT, takes place mostly in the 1980s -- a good way to distance the issue of illegal immigration and enforced deportation from today's difficult political climate. At the same time, this crime novel, told mostly from the point of view of INS (Immigration and Naturalization Service) agents, offers a fascinating view of the issues that have become today's fuel for flame. Joining the INS in Chicago in the late 1980s without having taken the "old boys" route through Border Patrol first, Nick Hayden has the rookie cards stacked against him. Idealistic and "overeducated" for the job, Hayden really wants to fit in anyway. His enthusiasm and remain edgy and uncertain. Hayden usually didn't remember his dreams and made little effort to do so. To him they were mere flights of the imagination, not to be taken seriously. But there was one dream he'd begun to have almost every week, and it disturbed him. It would always begin in a desert, the sun blazing through a cloudless sky -- the peaks of dry, craggy mountains looming hazily in the distance. Several figures in brown robes, like those of Franciscan monks, shuffled slowly along a sandy path. ... Nick, from a distance, would call out to get their attention, but they couldn't hear him. Kading's own pre-novelist career as a federal special agent took him into the INS, the EPA, and the FBI (what a combination!). So I was fascinated by the emotions and choices he provided for his fictional agents. Knowing some people who work on this side of today's enforcement issues also kept me glued to the pages, even when the writing was a bit too much "telling" instead of showing, and conversations felt overly predictable. 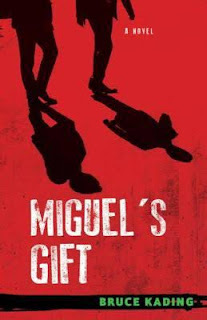 I found the mild suspense of the novel was heightened by my curiosity over how Kading would bring about the climax and where his protagonist would end up -- as well as Miguel and his family, of course! So I recommend this book strongly as an emotionally honest way to look at both the human and the criminal sides of immigration crime. It's not always a strong book, but it's a much-needed one, and I'm glad it came my way -- from Academy Chicago, an imprint of the Chicago Review Press. 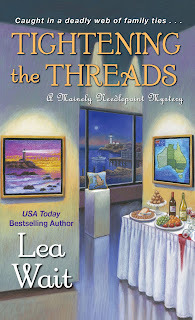 Lea Wait crafts two mystery series from her Maine home. The darker of the two is her Mainely Needlepoint series -- still an "amateur sleuth" type, as needlepointer Angie Curtis doesn't mean to become an investigator. But when her friend and fellow needlepointer Sarah Byrne suddenly discloses how she chose the seaside town for her new home, after leaving behind Australia, Angie can't help feeling intrigued. A mysterious family connection revealed? A possible fortune in artwork for her friend? TIGHTENING THE THREADS takes an ominous cast early on, and the complications multiply. When Sarah is suddenly accused of murder, as well as fabricating her new family connection, Angie can't resist stepping into the scene of the crime. But who could plan a deliberate murder within an old-time lobster bake among family members? And among all the possible people who could profit from this death, how can Angie prove Sarah's not responsible? Ted wasn't finished. Ignoring Michael's outburst, he continued. "As I said, we can get into the particulars of Sarah's story, and her journey to find us, later this week. But for now, just know that I believe with all my heart that Sarah is my niece. And that, because I knew questions would be asked about such an amazing story, I convinced her that we should have DNA tests. And, yes, they proved that, despite her name and accent, she is a Lawrence. I might add that during the few months I've known her she's more than proved herself worthy of our family. Sarah" -- he raised his glass -- "I drink to you, and officially in the presence of my children, welcome you to our family." Wait's adroit twisting of the family reunion hides other complications, and her protagonist, with dogged Maine persistence, begins to uncover more motives, more opportunities, and more methods that could be involved in uncle Ted's sudden demise. Although this is Wait's darker series, it's never gruesome ... even as I shuddered at moments as the seaside family home turned into the backdrop for old resentments and long-nurtured malice. 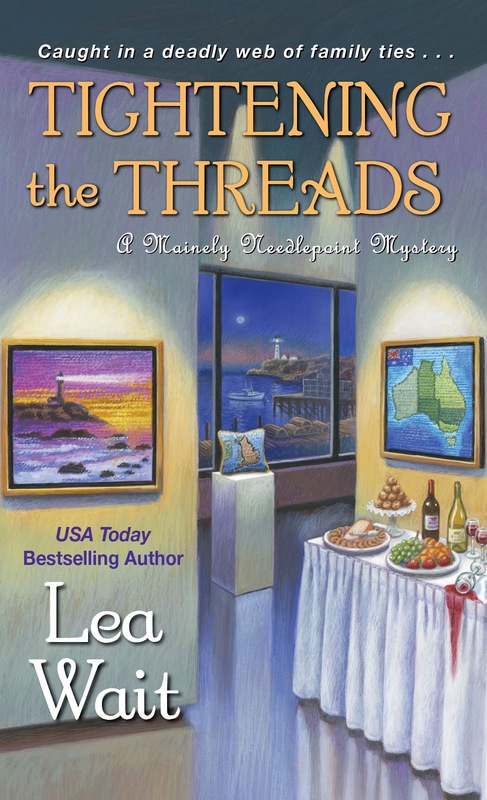 Convincing and swiftly paced, TIGHTENING THE THREADS continues Wait's strong set of titles (this is the fifth in this series), and it's clear there are more surprises ahead in sleuth Angie Curtis's new life in her grandmother's home town. The third in the "Reeder and Rogers" government espionage series is a winner! Max Allan Collins and Matthew V. Clemens have spun a page-turner that opens with the death of four US agents as Russia invades yet another small nation -- then security contractor Joe Reeder finds himself in direct contact with the US President, on a mission to figure out why the agents turned up there in the first place. EXECUTIVE ORDER races the clock as Reeder and his FBI ally Patti Rogers struggle to sort this out, alongside an apparent murder of the Secretary of the Interior. Collins and Clemens set the adventure in the not too distant future, a clever way to allow a few extra scientific discoveries and a heap of intervening history. But the dark forces moving against the President -- and Reeder and Rogers -- are motivated by a familiar urge: "What [Lawrence Morris] and all of the loyalists enacted was part of their overall mission to restore the greatness that President Harrison had so recklessly squandered." Half the time I thought I'd accidentally turned on some current news in this thriller; the other half, I reminded myself that it's the reader's job to let go of preconceptions and ride the flow of fictional events without too many questions. I had a really good time reading this -- I'd say it's pure escape fiction at its liveliest, except, of course, the themes of conflict within the federal government are serious and a real threat in our own time. Hope we can create as good a resolution to today's stresses and chaos as Collins and Clemens do in EXECUTIVE ORDER. You don't need to read the two earlier titles in the series first -- Supreme Justice and Fate of the Union -- because the authors carry the plot just fine. But it's fun to recognize some side mentions and if you're enjoying the pace and action, the other two belong on your shelf, too. No full review here because Clemens has become a friend. Also the book publisher is Thomas & Mercer, in paperback original form, which makes it tough to recommend for collecting. Pick up a copy for the fun of it, though! Texas mystery author Sara Rosett writes both "cozy" mysteries and a "heist" series -- and she's a tight, clever writer with a great eye for character and believable twists. 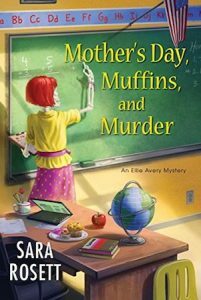 MOTHER'S DAY, MUFFINS, AND MURDER is way better than the slightly silly title suggests. Set at a Georgia elementary school where freelance home organizer Elly Avery often volunteers -- backing up the great teachers and staff who nurture her two kids -- the book opens with a hectic scene during one of the last weeks of the school year, when teachers, parents and enthusiastic students race around outside, enjoying special events and meals. Elly's one of the lead organizers for parent support (from gamekeeping to muffins to meeting the barbecued lunch caterers), so she's in and out of the office and classrooms, well, almost all day long. Which makes her one of the first to know when another visitor spots a woman's body stuffed into a storage closet, followed immediately by a fire drill that keeps Elly from immediately reporting the discovery to the police. By the time things are running normally again for the kids, the body's gone. But that's just the start of Elly's discovery of a series of uneasy and ultimately very dangerous interactions happening among the school's staff. Unlike many an "amateur sleuth," Elly Avery makes smart decisions and takes good care of herself and her kids (her husband's away on a military operation). And that makes it a pleasure to ride along with her as she unfolds the layers of deception at the school, mostly staying out of clear danger until the book's well-paced and intense finale. Hard to believe this is the first I've read from this accomplished author. Trust me, I'll be looking for more! I've already checked out her website: http://www.sararosett.com. MOTHER'S DAY etc. (the only thing I wished changed was the book title) is published by Kensington and came out a couple of weeks ago. Worth grabbing a copy for the summer reading stack! 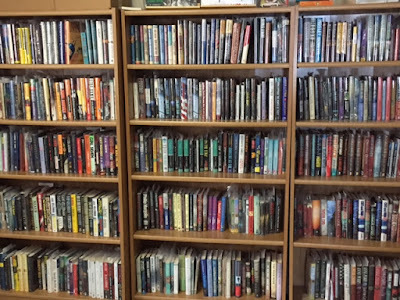 Today is the official date of closing Kingdom Books as a mystery collector's paradise. When Dave and I met (and yes, we soon married) 15 years ago this month, we decided to create the kind of mystery bookstore we'd want to step into: full of books in prime condition, many of them signed by the authors, and ranging from Sherlock Holmes pastiches to hard-boiled crime to police procedurals and traditional amateur-sleuth mysteries ... and including a wide time span, from the classics (Tey, Christie, Upfield, Hammett) to the newest strong mysteries in this week's New York Times book reviews. And, of course, in our own book reviews. The book reviewing will continue -- I can't stop reading mysteries, and I enjoy putting them into perspective for other readers to consider. And we have a few items we're letting go of in a little eBay "store" online (click here if you're curious). But the signs are down, the door is shut, and slowly the books are moving from the shelves into boxes. If you've dreamed of opening a mystery bookshop, or want to instantly add a wonderful mystery wing to what you have, let us know! 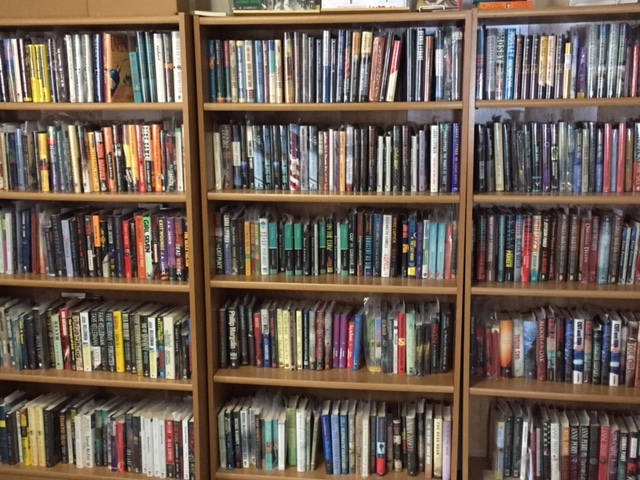 We have about 2500 books available, as a single lot only; we're glad to send you the list. About half are signed, and they are all in lovely condition (fine and near-fine, first editions, for the most part). We're not going away, and we're not sad (well, maybe a little sad). There are some great adventures ahead, and we both will be writing more, in our new life pattern. Stick with us for later discoveries! And, of course, tap your e-mail address into the white box on this page to get the fresh book reviews without any effort. I've got a long list of great titles to describe in the weeks, months, and years ahead.